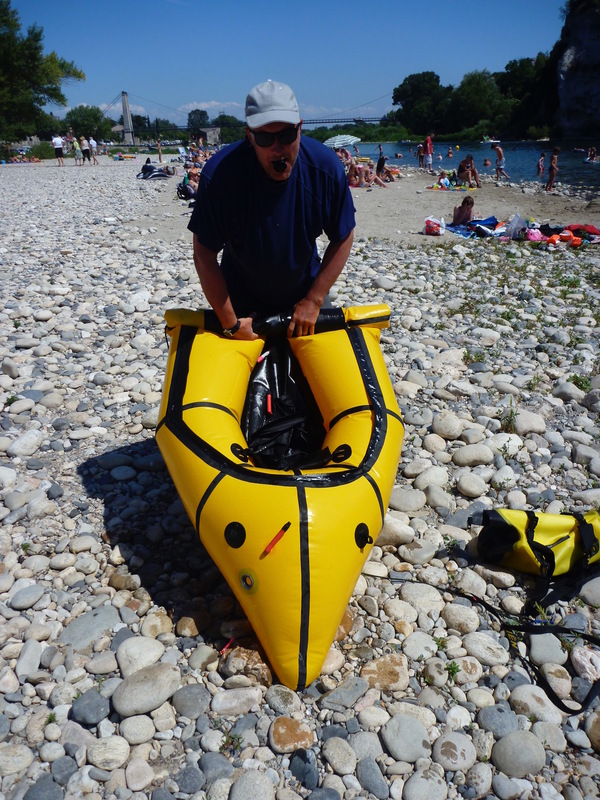 Packboat is my made-up word for easily portable boats that roll into a bag but deploy in minutes, in contrast with hardshell kayaks or canoes in aluminum, plastic, or composite. I’m here to suggest that if lugging a cumbersome hardshell on your overland rig isn’t for you, then a packboat weighing from 2 to 40 pounds and never bigger than a backpack might well be, while adding another great way to explore the outdoors. I’ve been doing as much since a thrilling day on Idaho’s Salmon River back in 2005. It was here I discovered that inflatable kayaks (IKs) could have more in common with tough commercial whitewater rafts than disposable “one-summer” beach toys. After decades of rattling around off-road with 4WDs and bikes, I still get a huge kick from the sensation of gliding serenely across the water. It’s capped off with the smug satisfaction of pulling the plugs, rolling the boat up, and moving on or heading back. 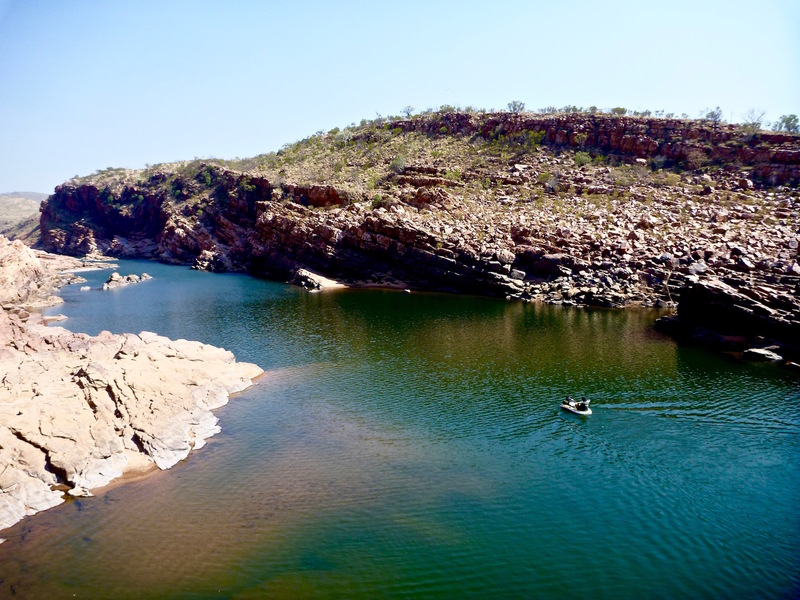 Since Idaho, I’ve paddled Western Australia’s Shark Bay, Ningaloo Reef, and remote Fitzroy River; New Zealand; Colorado and Utah; Iceland; the Balkans and Turkey, as well as several French rivers and right through the heart of London and Venice. 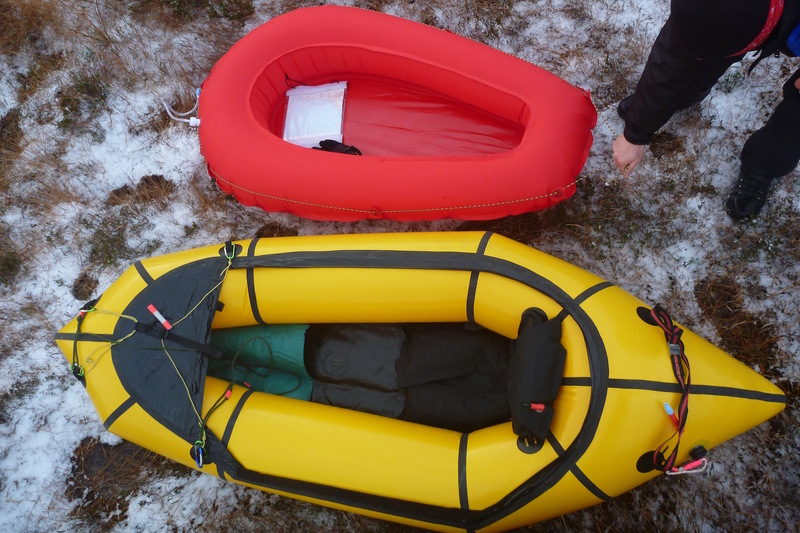 After trying a dozen boats, I’ve settled on a tough, seaworthy IK and a lightweight, hikeable packraft. Both can be transported simultaneously with camping gear on the back of my motorcycle. What’s Wrong with Hard Shells? 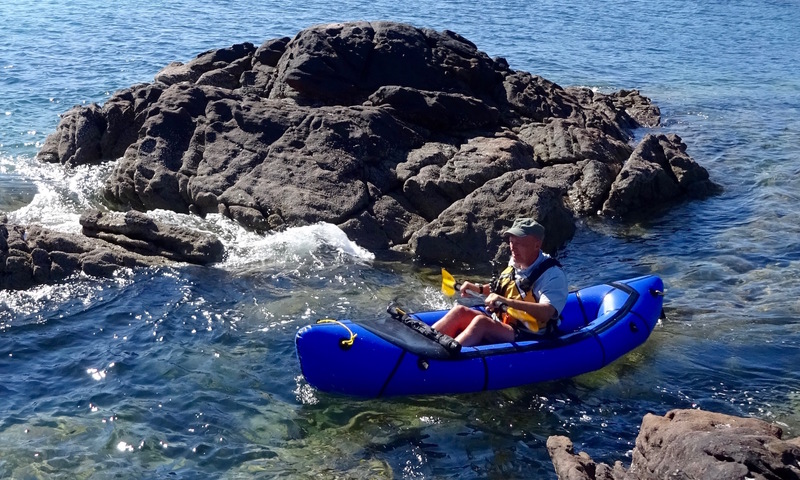 A plastic kayak or canoe is a great thing to have at your waterside property, and more specialized hard shells are clearly well suited to long expeditions or white-water “hairboating.” But for those on the road and simply looking for some exercise, fresh air, or the chance to hook a fish for dinner, a compact packboat gets you out on the water and takes up little room. Park up by a remote mountain lake, a tranquil backcountry river, or an isolated beach, and you can be paddling in just a few minutes longer than it takes to unstrap an 80-pound hardshell and lug it to the shore. 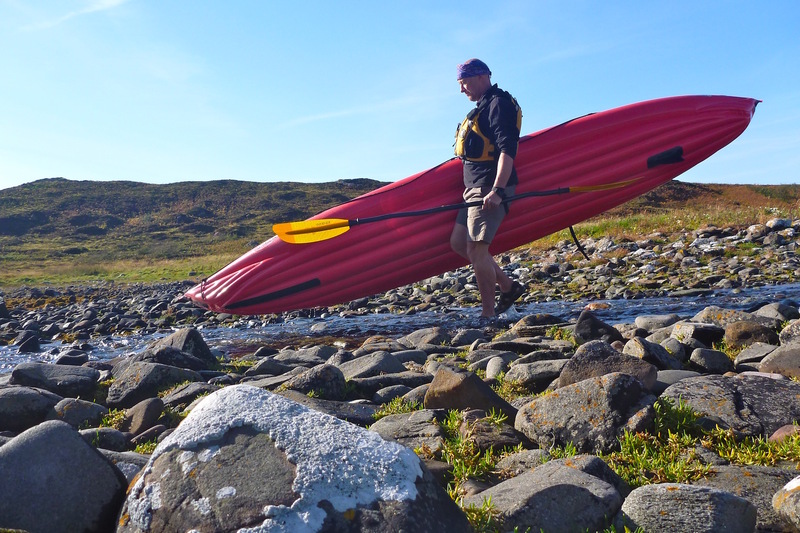 IKs have real-world safety advantages for ordinary recreational paddlers, too. No deck makes entry and egress easy, not least on a rocky shore, and even when completely swamped, an IK cannot sink. Should you fall out or capsize, flipping the boat back upright drains it instantly and crawling back aboard requires no assistance, bailing, certification in special techniques or flotation aids (though it’s a good idea to practice beforehand). These benefits are also shared with self-bailing hardshell sit-on-tops (SoT), but an SoT’s weight and portability issues remain. In all my years, I’ve only had one thorn puncture. Some designs incorporate inflatable tubes to help tension the structure, add buoyancy and ease assembly—Ally’s even come with a rubber “assembly” mallet. 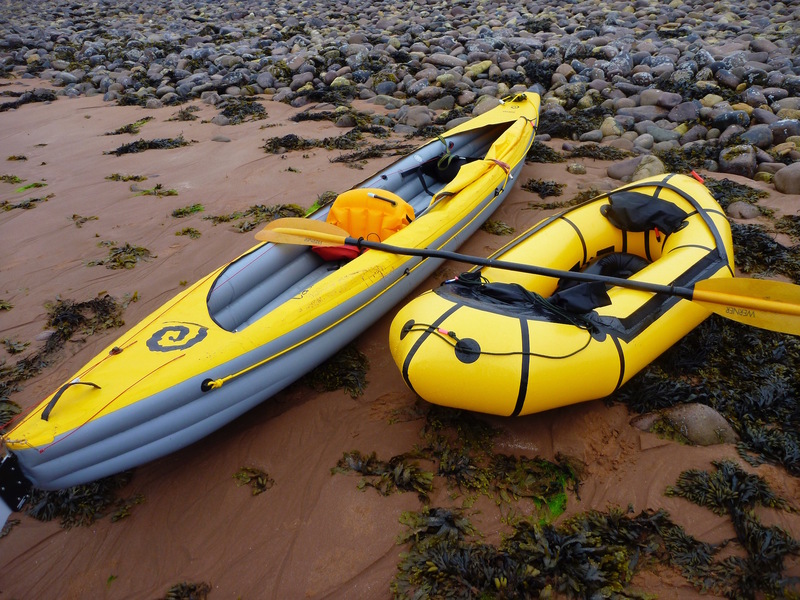 Kayak skins can be one-piece, incorporating a deck with a sealable hatch, making them suited to rough waters when combined with a spray skirt. Optional fitted decks are more versatile, but will never be as watertight. 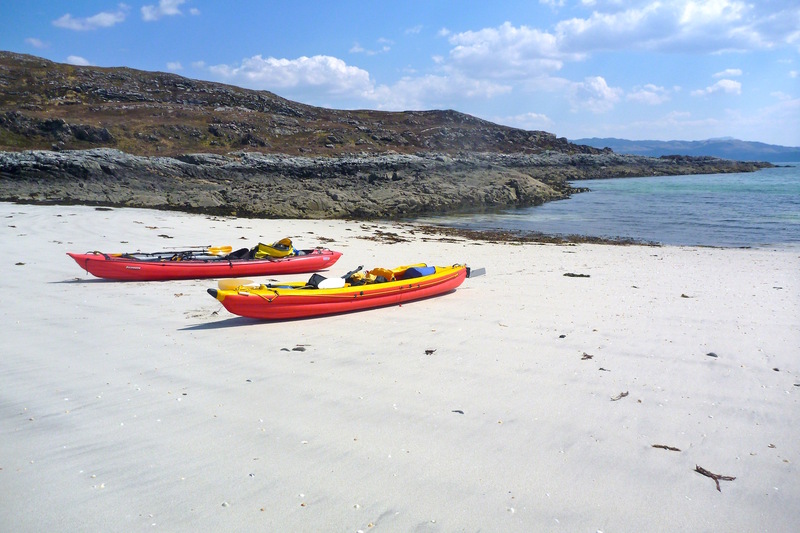 Realistically, for the sort of fair-weather paddling discussed here, paddling an open boat is far more agreeable. 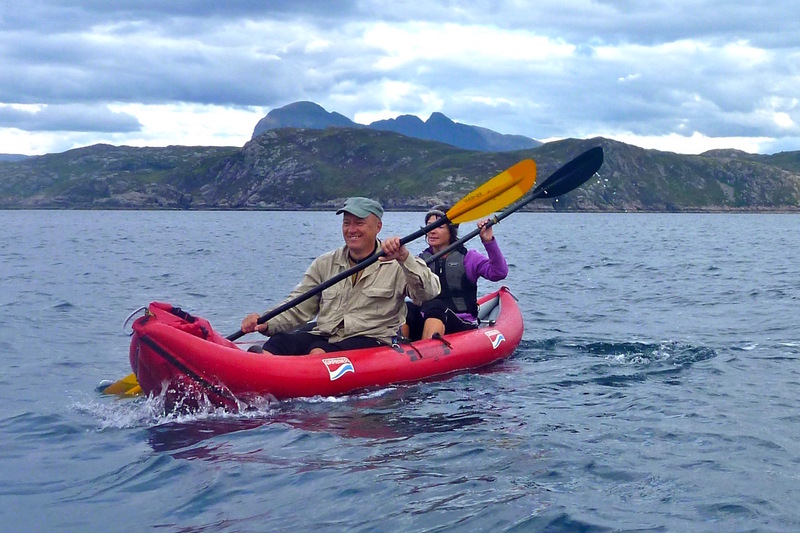 A high-end folding kayak like a Feathercraft Kahuna has the elegant, low profile of a proper hardshell sea kayak, making them suited to multi-day journeys that will eventually encounter strong winds. But a vehicle-based overlander with a boat in the back will be more inclined to spontaneous short outings that coincide with an agreeable location and ideal weather. 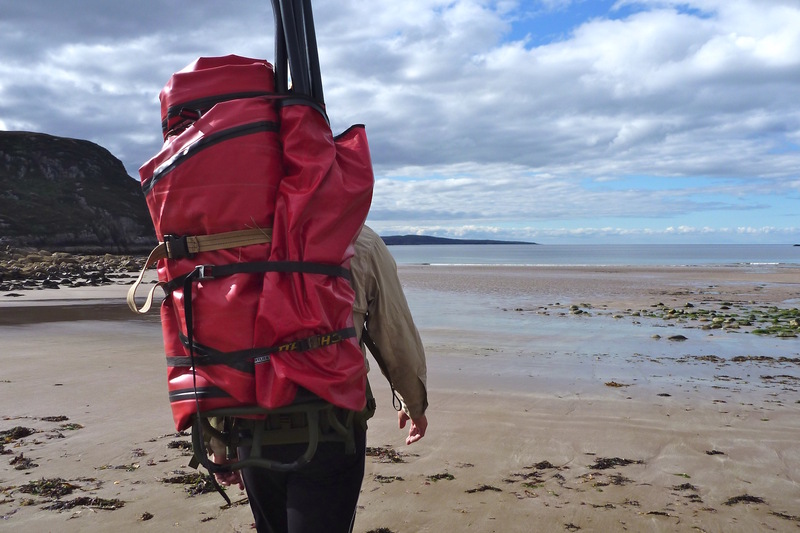 With a packboat, ease of portability, deployment, and use all override expeditionary levels of performance. 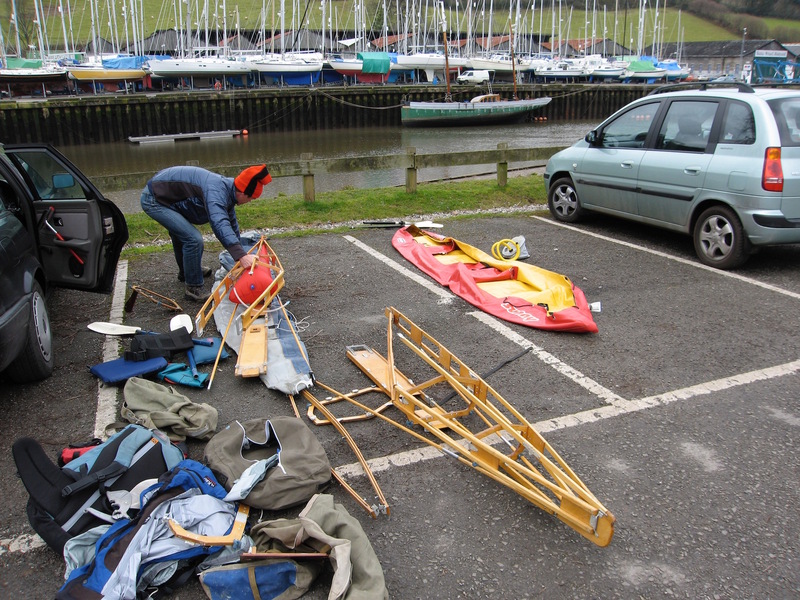 Drawbacks with folders include the relative complexity and duration of assembly, when all you want is an evening paddle. And compared to rugged, maintenance-free hard shells and IKs, alloy corrosion from seawater and the relative fragility of the frame and skin pressed against it are all issues I’ve encountered. (Small holes are easily fixed with tape.) Folders need to be assembled without distractions, handled carefully, then dried and cleaned properly. (Once you get into packboats, you’ll soon find what a nuisance curious onlookers can be.) 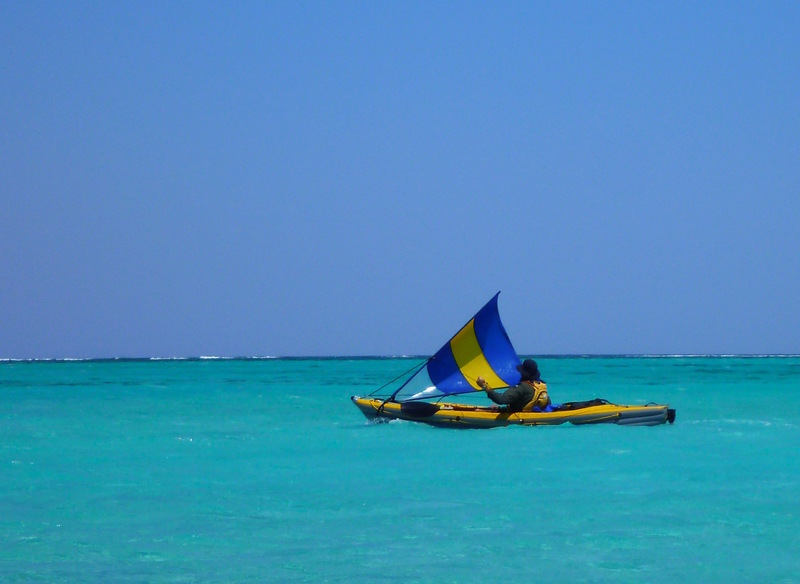 All up folders are more suited to longer pauses during your travels than spur-of-the-moment paddles. The main problem with IKs is image. Or put another way, identifying the durable, well-designed examples among the zillions of cheap, saggy, over-wide, and leak-prone pool toys. It’s a predicament that doesn’t apply to hard shells or folders; the cheapest, heaviest rotomolded hardshell slab will laugh off years of neglect, while the relative complexity of a folder compels a worthwhile design and a caring owner. In this sense, IKs are a bit like MTBs: you can buy an overweight piece of junk with “full suspension” from a superstore for $98. Or you can buy something decent that’ll be a joy to own and ride for years. 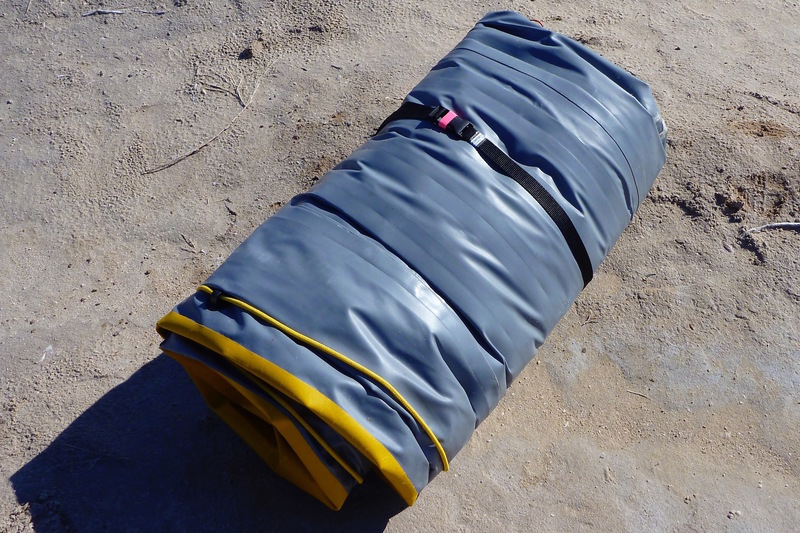 Glued, sewn, vulcanized, or heat-welded from several segments, better IKs use tough, stretch-free, UV-, puncture- and abrasion-resistant fabrics as found on commercial white water rafts that will last over 20 years. Broadly speaking, a woven fabric core is bonded to either synthetic rubber or plastics like PVC (again, rarely mentioned by name) or polyurethane (TPU). Synthetic rubbers like Hypalon, EDPM, Nitrilon or Orca must be laboriously hand glued, but hulls fold compactly without creasing and give better against pinpricks. 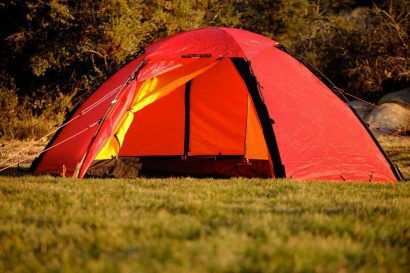 Manufacturers include Czech-made Gumotex (branded Innova in the US), Grabner (Austria), and NRS (Idaho). PVC is stiffer, costs less, and can be machine heat-welded. Stiffness aids rigidity, which improves response, but folds can crease badly, and running pressures and design are also factors in hull rigidity. In the US, brands include Sea Eagle, Aire (Tributary), Advanced Elements, Aquaglide, and NRS (again), plus Incept (NZ). IKs are constructed in two ways, and the difference is worth noting. Thin, replaceable inner tubes fill a PVC hull shell to give shape and rigidity, like a bicycle tire. Or several panels are glued or heat-welded into an airtight, load-carrying tubeless monocoque. The former costs less to make, the latter one-piece design (common in Europe) wipes down and dries quickly which is better on the road. Once inflated, the bulky hull and floor make an IK wider, higher in the water as well as less roomy inside, compared to folders or hard shells. This all affects paddling effort and control as winds exceed Force 4 (15 km or mph). As doubtless an episode of Baywatch vividly demonstrated, once capsized, a carefree frolicker’s inflatable can blow away faster than they can swim after it, even in a skimpy red swimsuit. Most IKs don’t have decks and in this way resemble canoes. If a canoe’s raised bench seating and slower, single-bladed paddling style suit you, lay a plank across an IK’s sides, or buy an inflatable canoe with bench seats. Just remember, sat higher, such a boat becomes more tippy. Until you learn to manage it, tippiness can ruin the paddling experience, but excessive width can kill agility—and there will be times when you need speed. 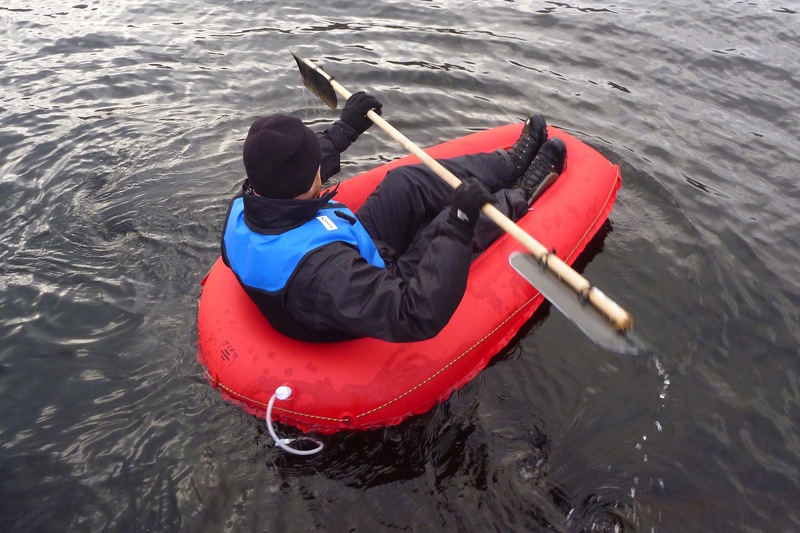 Sat low, a yard-wide packraft is exceedingly stable but comparatively slow. An IK’s thick, inflated floor raises the center of gravity that is compensated by added width. But because IKs get pitched at the family-friendly end of the market where price and space for the dog matter more than performance, some brands go too far to ensure everyone feels safe and secure. In rough seas, my 30-inch-wide, open IK will be swamped long before I get tipped out of it. Up to a point, IK thigh straps can enable better bracing, just like a hardshell’s deck or a canoe’s kneeling stance. When combined with a solid footrest, this body triangulation also makes for a more efficient draw by working the core muscles. Lately, slim, flat panels of drop-stitch (DS) fabric are replacing IKs’ bulky, RIB-like tubes. 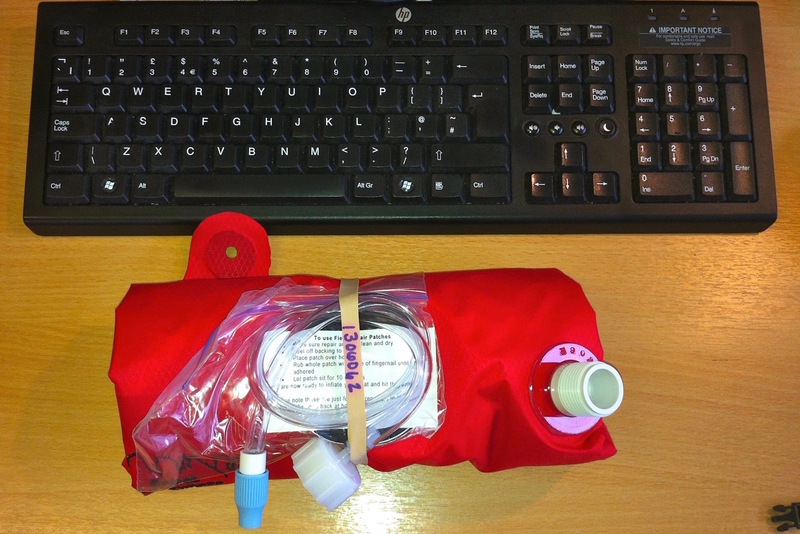 With suitable pumps, DS panels can be inflated to much higher pressures, giving hardshell-like rigidity while being immune to overheating ruptures when an IK is inadvertently left in the sun. This rigidity is especially useful on longer boats which otherwise sag midway under a solo paddler’s weight. 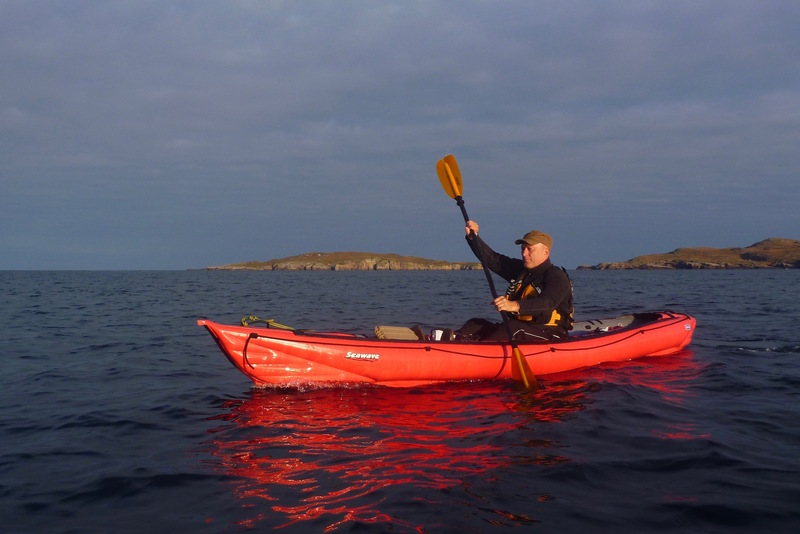 But because any kayak seeks to be more than a flat-floored, flat-sided barge, full DS IKs may be harder to handle on anything other than flat-water cruising. Thigh braces will help. 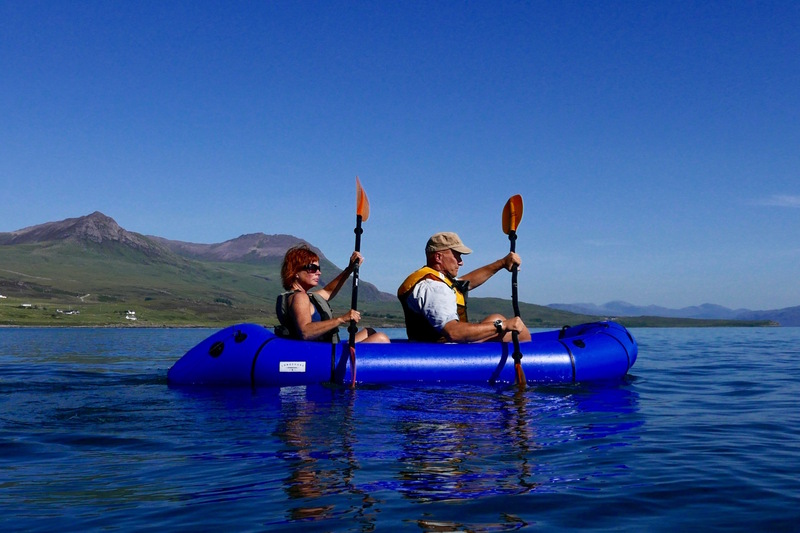 Conceived in Alaska and developed by Alpacka in Colorado, packrafts are one- or two-person rafts, compact and light enough to hike with and deploy on water bodies as needed. Like MTBs in the 1980s, they’ve revealed a whole new way of enjoying the outdoors. Inflated without pumps, the tubeless, single-chamber TPU construction delivers a tautness, durability, and responsiveness you’ll never get from vaguely similar $30 PVC pool toys stacked up to the roof in Walmart. Now brands like MRS, Anfibio, Longshore, Kokopelli, and Nortik have entered the market with their own variants and that competition has helped prices fall. You can even buy a template and try heat-welding your own. 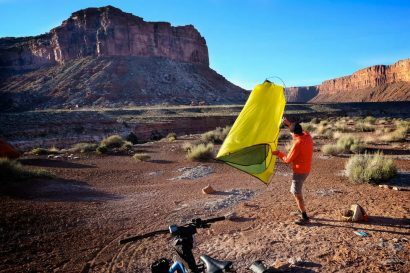 Evolution has brought specialization, and there are now decked packrafts for the gnarliest white water, long tours, heavy payloads or two paddlers, as well as ultra-light, pocketable crossrafts from Supai or Anfibio. There are compromises to payload, durability, and agility, but a crossraft would suit a motorcyclist determined to get on the water once in a while. 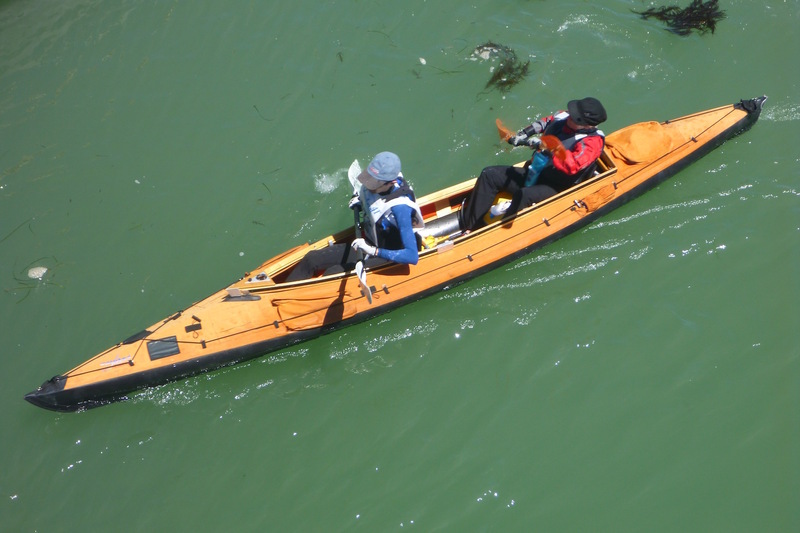 More enjoyable to paddle in a current, stubby solo packrafts won’t glide or cruise on flat water like a slim, 15-foot kayak. 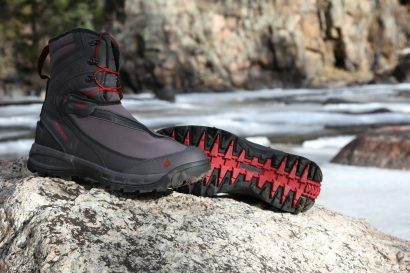 As such, a double might be more suited to road trippers unless you can see yourself exploiting a packraft’s all-terrain portability on foot as well as water. The SUP craze sweeps all before it, and a drop-stitch SUP board is lighter and nearly as stiff as its rigid equivalent but rolls up to the size of a yoga mat. You won’t find a simpler way of getting out on calm waters and toning up that core. Just remember that the paddler’s adage, “dress for the swim” is even more apt with SUP’ing and, wherever you get to, anticipate the weary paddle back. When standing up, the view may be great, but even a light breeze can become hard work after a while. 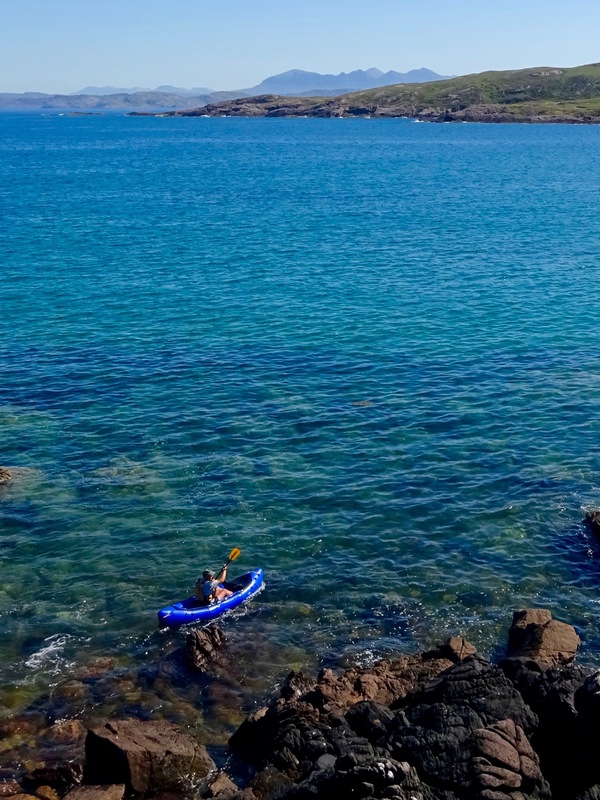 Having a SUP paddle that converts to a two-bladed kayak paddle means you can sit or kneel down and still keep moving at a good pace through the chop. It’s not paddling without a paddle, and as with packboats, the keys are lightness, strength, stiffness as well as ease of stowage and price. A two-part composite paddle ticking all the boxes and with variable feathering (relative angle of blades) will be well over a couple of hundred dollars. For infrequent, short-term use, an alloy-shafted, plastic-bladed two-part cheapie will do, ideally with two feathering presets. Most right-handers find left-blade-forward 45 degrees works best. 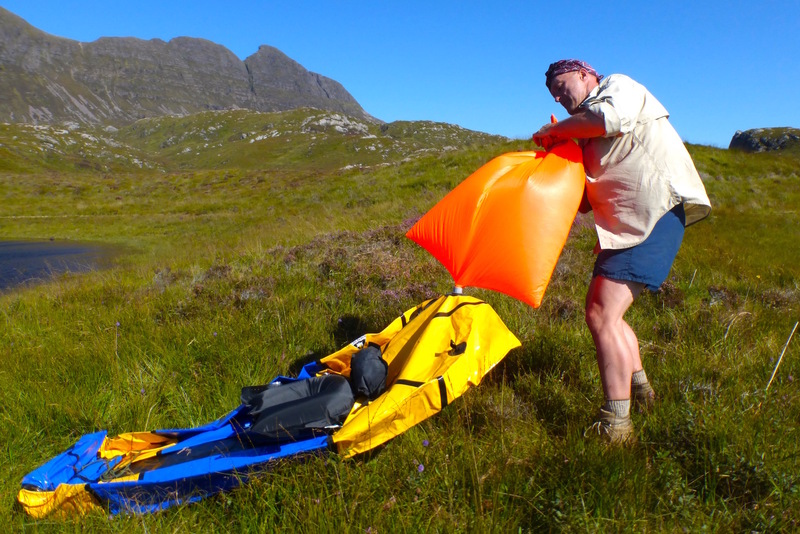 As mentioned, when empty, an inflatable, especially a 4-pound packraft, can blow away faster than you can swim or run after it. A paddle leash will act as an anchor; on the water, a body leash will be even more reassuring. 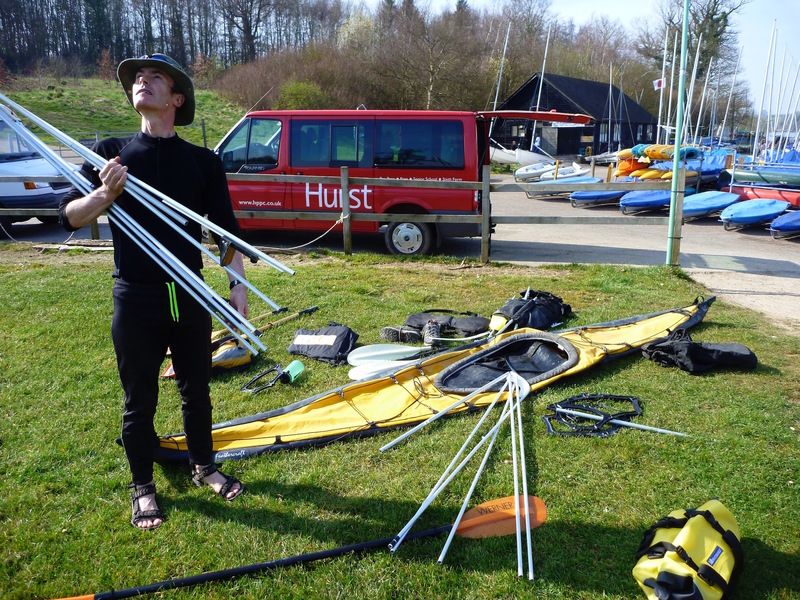 With any sort of rigging, consider entrapment issues, especially on fast-flowing rivers. In the middle of nowhere, if you think a body leash is needed, are you sure it’s safe enough to be out there at all? 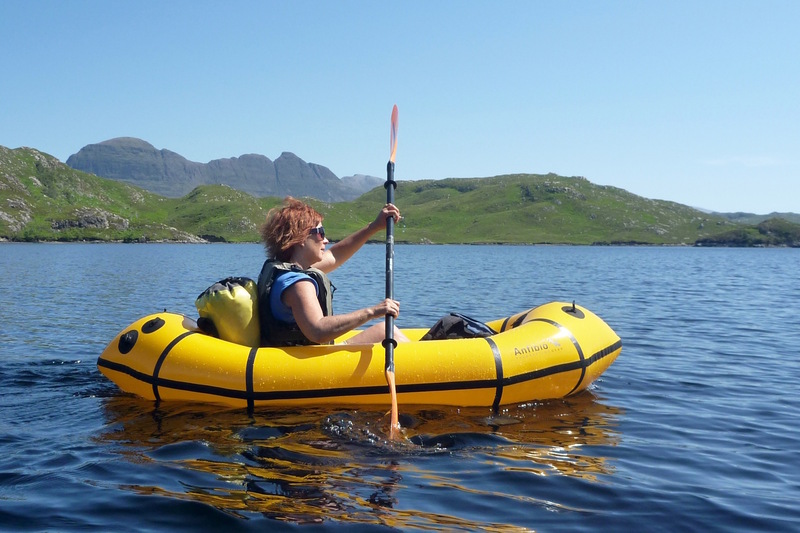 Last but not least, even if you don’t choose to wear it on a balmy, tropical lagoon, a personal flotation device (life jacket) is a vital part of your kit, especially on fast flowing rivers or out at sea. If nothing else, the pockets are handy for the camera. 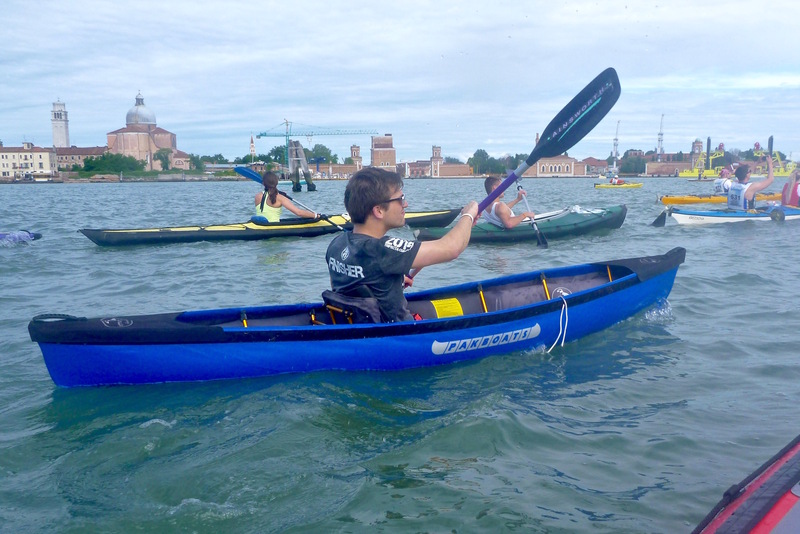 Instructional courses rarely cater to packboats, but paddling itself is as intuitive as walking. Nevertheless, if you’re new to watersports, it’s vital to understand how currents move in rivers as well as the nature and actions of tides. The latter doesn’t just go in and out every few hours, but will also ebb and flow in a given direction along an open coast and in a fortnightly cycle. A seemingly sheltered natural harbor might take eight hours to fill but drain in four, possibly leaving you stranded, knee-deep in the cloying mud. Less predictable is the wind. Travel and exploration being what it is, there’ll be times when you rock up at a breathtaking but unfamiliar and remote locale without the means to research the weather forecast or other factors specific to that place. River, lake, or shore, having the wind come up and eventually tipping you, exhausted and far from shore, into cold, turbid water is a classic boating accident. Out of the mountains, in warmer latitudes, mornings usually start calm with the wind building as the day warms up. Plan accordingly and consider the factors mentioned above, as well as your own abilities, especially if you paddle alone. If you’re not an experienced pro, visualize your vehicle-based packboating like a harmless stroll: a singular and relaxing way to spin down from a day in a cramped cab to gain a wonderful new viewpoint on the world around you. canoekayak.com Probably the best all-round paddling magazine and an excellent online resource. Occasionally covers packboats. inflatablekayaksandpackrafts.com Chris Scott’s packboating website. theboatpeople.com Long-established California-based expert on IKs and rafts.